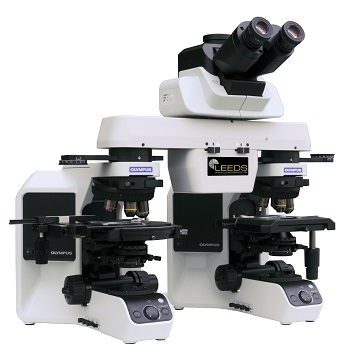 The Leeds LCT trace evidence comparison microscope is designed for forensics and other sciences where the critical comparison of specimens such as hair, fibers, paint chips, plant matter and solid or particulates is needed. The LCT’s high-quality optical system intrinsically provides superior color and intensity balance requiring no adjustment by the operator. Providing a large 22mm field of view and an erect, unreversed image, the LCT allows the operator to quickly and easily manipulate specimens for examination. With the LCT comparison microscope, two specimens can be viewed as split-field, superimposed or individual images. Separate slide controls allow for continuous adjustment from 100% of the left image to 100% of the right image, or any position in between. A detent locates the center split position on the right image. The center split position for left images is user adjusted allowing the dividing line width to be varied as desired. Height range from table surface to eye point - from 19" to 23"
Length, optical center to optical center - 13 ¼"
The compact footprint of the LCT takes up minimal work space and allows for one person to easily operate both microscopes. The LCT is capable of single microscope use applications such as investigation of biological, medical or chemical specimens in all types of illumination.